Hundreds of thousands of cheering people who waited several hours in steaming heat have greeted Pope Francis at his arrival in the Philippines. People lined the streets of the capital Manila to glimpse his motorcade. Millions more are expected to come out to see him over his five-day visit to the nation’s 80 million Catholics. Pope Francis said that a priority of his visit would be to send a message to the poor who face “social, spiritual and existential” injustices. “The central nut of the message will be the poor, the poor who want to go forward, the poor who suffered from Typhoon Haiyan and are continuing to suffer the consequences,” the pontiff said while travelling to the Philippines from Sri Lanka. Typhoon Haiyan killed or left missing more than 7,300 people, razing villages to the ground in the centre of the Philippines in 2013. Leyte province was especially badly affected, and it is there where Pope Francis will seek to console survivors on January 17. The Pope said that also prominent in his mind were some Filipino workers at the Vatican who had left their families for jobs overseas. The Philippines is one of the world’s largest exporters of labor – it is estimated that about a tenth of the population has left the country in search of work – and reports of their abuse and exploitation are commonplace. President Benigno Aquino has also spoken of his determination to eradicate poverty, although he has been at loggerheads with the local Roman Catholic Church over a 2012 reproductive health law that promotes artificial birth control. 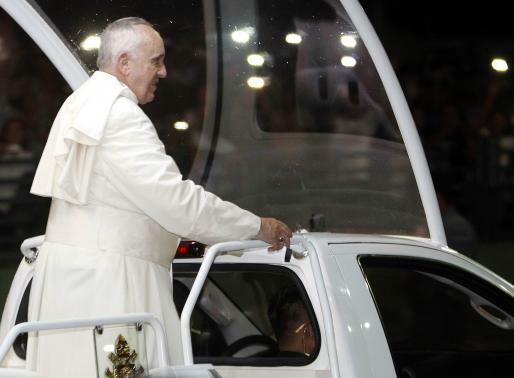 After leaving the airport, Pope Francis boarded an open-sided Popemobile to travel the 7 mile route to the Apostolic Nunciature in Manila, where he is staying. The highlight of Pope Francis’ visit will be a huge open-air Mass in Manila on January 18 and a visit to Tacloban to meet survivors of a devastating typhoon in November 2013. Security will be tight after failed attempts to kill two previous popes. Tens of thousands of soldiers and police have been deployed. Pope Francis is the fourth pontiff to visit the Philippines – 80% of its 100 million people are Catholic. A three-day public holiday has been declared in Manila to clear the traffic.